Endpoint detection and response (EDR) tools are built to supplement endpoint security with increased detection, investigation, and response capabilities. However, the hype surrounding EDR tools can make it difficult to understand how exactly they can be used and why they are needed. Making matters worse, today’s EDR solutions often struggle to provide value for many organizations as they can be difficult to use, lack sufficient protection capabilities, and are resource intensive. Sophos Intercept X Advanced with EDR integrates intelligent EDR with the industry’s top-rated endpoint protection in a single solution, making it the easiest way for organizations to answer the tough questions about security incidents. Here are some additional reasons to consider an EDR solution. IT and security teams are often motivated by attack and defense metrics, yet the hardest question for most teams to answer is “are we secure right now?” This is because most networks have sizable blind spots that make IT and security teams struggle to see what is going on inside their environments. Lack of visibility is the primary reason why organizations struggle to understand the scope and impact of attacks. This often manifests itself when an incident occurs and the team assumes they are safe because that incident was detected. Intercept X Advanced with EDR provides additional insight that determines if other machines were impacted. For example, if a suspicious executable was found on the network, it would be remediated. However, the analyst may not know if that executable exists anywhere else in the environment. With Intercept X Advanced with EDR, this information is readily available. Being able to view the other locations where threats exist allows the security team to prioritize incidents for additional investigation and potential remediation. Generating a clear view of an organization’s security posture also provides the benefit of being able to report on compliance status. This information will help identify areas that may be vulnerable to attacks. It also allows administrators to determine if the scope of an attack has impacted areas where sensitive data is housed. For example, if malware was detected that exfiltrated data out of the network, an analyst would need to determine if impacted machines housed medical information that was subject to HIPAA (Health Insurance Portability and Accountability Act – US regulation). This would be a much simpler exercise with Intercept X Advanced with EDR. As an added compliance benefit, it would also be much easier to demonstrate that patient information is being protected thanks to increased endpoint visibility. When it comes to cybersecurity, even the most advanced tools can be defeated given enough time and resources, making it difficult to truly understand when attacks are happening. Organizations often rely solely on prevention to stay protected, and while prevention is critical, EDR offers another layer of detection capabilities to potentially find incidents that have gone unnoticed. Organizations can leverage EDR to detect attacks by searching for indicators of compromise (IOCs). This is a quick and straightforward way to hunt for attacks that may have been missed. Threat searches are frequently kicked off after a notification from third-party threat intelligence: for example, a government agency (such as US-CERT, CERT-UK, or CERT Australia) might inform an organization that there is suspicious activity in their network. The notification may be accompanied by a list of IOCs, which can be used as a starting point to determine what is happening. Sophos Intercept X Advanced with EDR provides a list of the top suspicious events, so analysts know exactly what they should be investigating (coming in 2019). By leveraging SophosLabs machine learning capabilities, a list of the top suspicious events is presented, ranked by their threat score. This makes it easy for analysts to prioritize their workloads and focus on the most important events. Suspicious events also highlight a common scenario where analysts are being called upon to determine if something is truly malicious. This pertains to activity that does not appear to be malicious enough to automatically convict but still appears suspicious enough to warrant a deeper look. Think of it as falling in a “grey area” where additional analysis is needed to confirm if it is malicious, benign, or unwanted. Once incidents are detected, IT and security teams usually scramble to remediate them as fast as possible to reduce the risk of attacks spreading and to limit any potential damage. Naturally, the most pertinent question to ask is how to get rid of each respective threat. On average, security and IT teams spend more than three hours trying to remediate each incident. EDR can speed this up significantly. The first step an analyst might take during the incident response process would be to stop an attack from spreading. Intercept X Advanced with EDR isolates endpoints on demand, which is a key step to stop a threat from spreading throughout the environment. Analysts will often do this before investigating, buying time while they determine the best course of action. The investigation process can be a slow and painful one. This of course assumes an investigation occurs at all. Incident response traditionally relies heavily on highly-skilled human analysts. Most EDR tools also rely heavily on analysts to know which questions to ask and how to interpret the answers. However, with Intercept X Advanced with EDR, security teams of all skill levels can quickly respond to security incidents thanks to guided investigations that offer suggested next steps, clear visual attack representations, and built-in expertise. When an investigation is concluded, analysts can respond with a click of a button. Rapid response options include the ability to isolate endpoints for immediate remediation, clean and block files, and create forensic snapshots. And if a file is mistakenly blocked, it can be easily reversed. Figures 4: Action buttons are located throughout Intercept X Advanced with EDR that offer multiple remediation options, with “clean and block” being the most common. By a large margin, organizations looking to add endpoint detection and response capabilities cite “staff knowledge” as the top impediment to EDR adoption. This shouldn’t come as a great surprise, as the talent gap for finding qualified cybersecurity professionals has been widely discussed for several years. This barrier is especially pronounced with smaller organizations. Security analysts: These are the front-line analysts tasked with triaging incidents and determining which alerts need to be immediately addressed. Ideally, they’re also able to proactively hunt to detect any attacks that may have gone unnoticed. Intercept X Advanced with EDR automatically detects and prioritizes potential threats (coming in 2019). Using machine learning, suspicious events are identified and given a threat score. The events with the highest scores are the most immediately important. Analysts can quickly see where to focus their attention and start investigating. Malware analysts: Organizations may rely on malware experts that specialize in reverse engineering suspicious files in order to analyze them. Not only is this approach time consuming and difficult to achieve, but it assumes a level of cybersecurity sophistication most organizations do not possess. Malware analysts are needed to decide if a file that was not blocked is actually malicious. They also may look at files that were convicted but may actually be false positives. Intercept X Advanced with EDR offers a better approach to malware analysis by leveraging machine learning. Using the industry’s best endpoint malware detection engine, malware is automatically analyzed in extreme detail, breaking down file attributes and code components and comparing them to millions of other files. Analysts can easily see which attributes and code segments are similar to “known-good” and “known-bad” files so they can determine if a file should be blocked or allowed. Threat intelligence analysts: Investigations may rely on third-party threat intelligence (often at an additional cost) to add insight and context into threats. Analysts are needed to interpret and integrate this data to ensure it adds value. Threat intelligence can be used as a starting point to investigations, as a means for asking the security community what it thinks of a suspicious file, or to determine if an attack is targeting the organization. 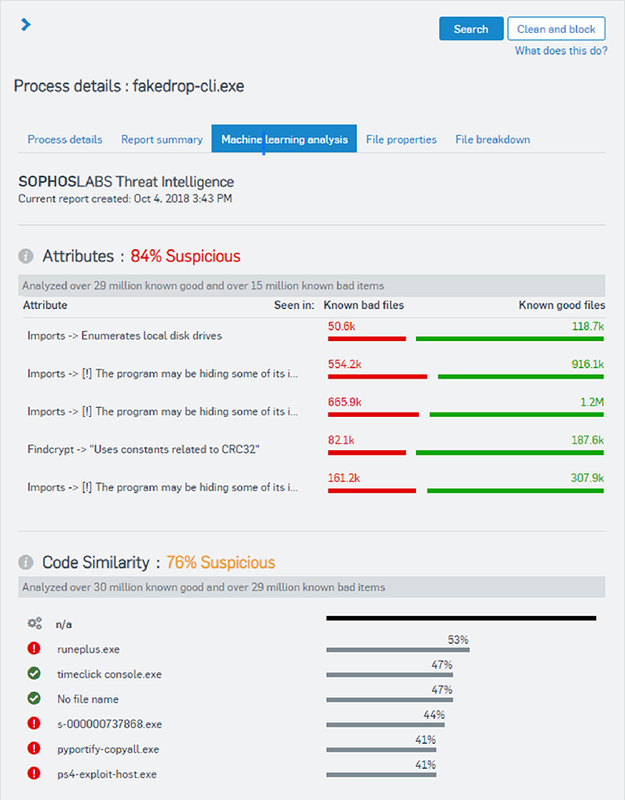 Intercept X Advanced with EDR provides IT and security administrators the ability to gather more information by accessing on-demand threat intelligence curated by SophosLabs. To maintain full visibility into the threat landscape, SophosLabs tracks, deconstructs, and analyzes 400,000 unique and previously unseen malware attacks each day in a constant search for the latest and greatest attack techniques. This threat intelligence is collected, aggregated, and summarized for easy analysis so teams that do not have dedicated threat intelligence analysts or access to expensive and hard to understand threat feeds can benefit from one of the top cybersecurity research and data science teams in the world. Figure 6: Machine learning analysis displays the attributes, code similarity, and file path analysis for powerful yet simple analysis. Security analysts have recurring nightmares where they have suffered an attack: an executive screams, “How did this happen? !” and all they can do is shrug their shoulders. Identifying and removing malicious files solves the immediate problem, but it doesn’t shed light upon how it got there in the first place or what the attacker did before the attack was shut down. 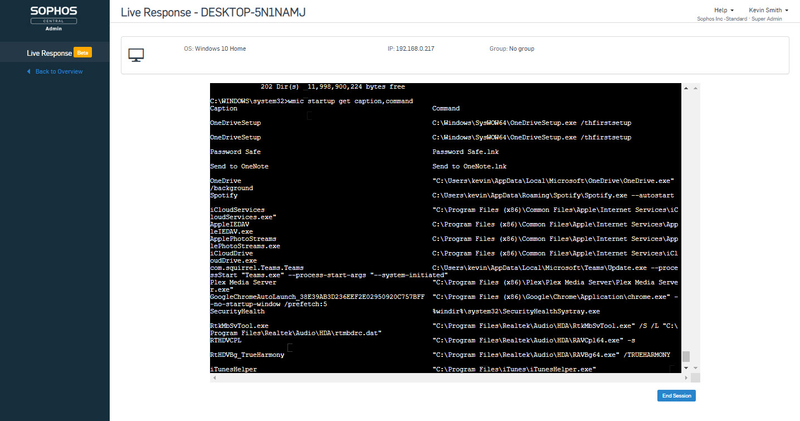 Threat cases, included with Intercept X Advanced with EDR, spotlight all the events that led up to a detection, making it easy to understand which files, processes, and registry keys were touched by the malware to determine the impact of an attack. It provides a visual representation of the entire attack chain, ensuring confident reporting about how the attack started and where the attacker went. More importantly, by understanding the root cause of an attack, the IT team will be much more likely to prevent it from ever happening again. Figure 7: Threat cases provide a visual and interactive representation of the attack chain. Find out more about the Intercept X Advanced with EDR and take it for a free test drive.